COLLECTORS VERSION, Second in the Holiday Barbie series from Carlton Cards. *This SECOND IN THE SERIES ornament as stated on the box, has #2 embossed on the bottom of the ornament. NOTE: This is the collectors version, 2nd in series with fabric embellishments. The lower priced version available at discount stores, is smaller in size, different sculped face, no fabric details and not a numbered series. Note: Barbie ornaments will not be offered in the 2014 Hallmark Keepsake Ornament line. The licensing for Barbie ornaments is now exclusively held by American Greetings for their Carlton Heirloom ornament line. I bought this for a member in my Local Club who makes wreaths for a Charity. She said Barbie is a big seller, so I try to help her out. I didn't care for the face on this one. Barbie is beatifully dressed and is looking lovely on my tree as I did the tree 1st December. The Hallmark collectables are so well made that they will be on my tree each year with pride of the great product. Beautiful-my granddaughter will love this for her Barbie ornament tree. Hooked on Ornaments my favorite store for finding ornaments I want-they give special service on all orders. Thank you. Will shop again. 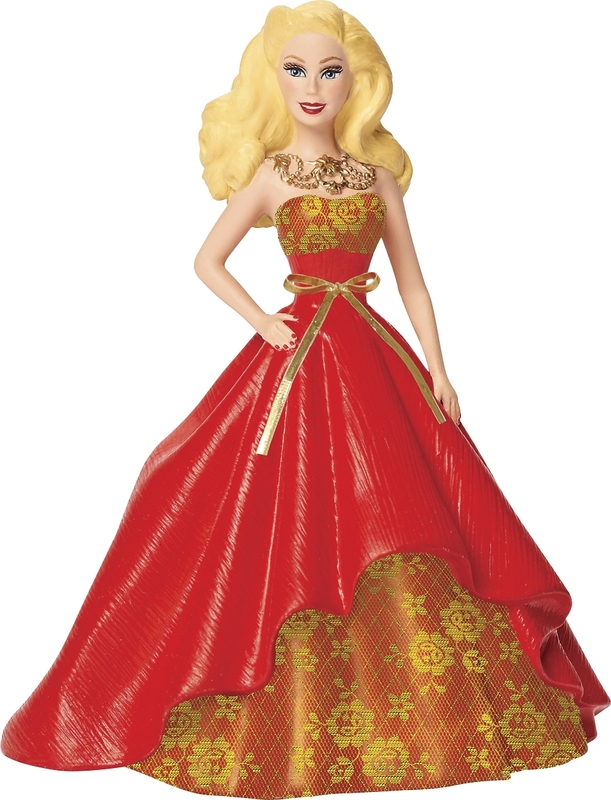 2013 Holiday Barbie by Carlton #1 - in Series with 25 Yr Snowflake Charm!